The Watershed Conservation Resource Center (WCRC) worked with the City of Fayetteville, local landowners, and partners to restore 4,600 ft of the West Fork White River (WFWR) near Drake Field in Fayetteville, AR. A detailed assessment of the site was conducted and a natural channel stream restoration design was developed and implemented for the unstable section of river. The project was funded by an EPA Section 319(h) grant administered by the Arkansas Natural Resources Commission with matching funds provided by project partners. The initial assessment began in 2010 and construction was completed in May 2014. The WFWR is a major tributary of Beaver Lake, which is the primary drinking water source for over 400,000 Northwest Arkansas residents. Since, 1998, the WFWR has been on the 303(d) list ofimpaired water bodies with the Arkansas Department of Environmental Quality citing the cause of impairment to be excessive amounts of siltation. A 2004 WFWR watershed assessment indicated that sediment loads from streambank erosion contributed 66% of the total sediment load. 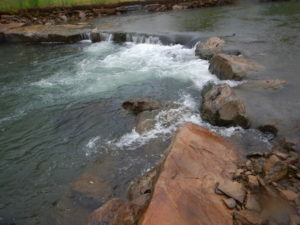 Based on a study conducted by the WCRC, the site was identified as a high priority for restoration. Measured streambank erosion rates prior to implementation of the project were as high as 26 feet/year, resulting in the generation of 4,000 tons/year of sediment during average flow years. 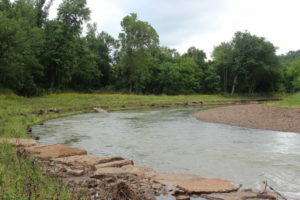 The WCRC utilized a natural channel design approach to create a stable channel that will reduce streambank erosion and sediment and phosphorus loads to the river. Southern Excavating, LLC of Fairhope, AL constructed the channel to specific dimensions designed to restore the river to a stable form based on local reference reach data. The restored channel moves the river away from severely eroding banks and eliminates abrupt bends in the channel. Structures made of natural materials were constructed to deflect higher velocity flow toward the center of the channel, reducing stress on the banks and reducing erosion potential. An entirely new channel was excavated to create a path for the river that would prevent accumulation of gravel. A portion of the old channel was converted into a series of riverine wetlands. The wetland areas provide water storage, create unique habitat, and filter water that passes through them. The preservation and addition of vegetation was a key component of the restoration project. During construction, disturbance to existing vegetation was minimized to keep mature root mass intact for additional streambank stability. Over 15,000 bare root seedlings, 5,000 live stakes, and 4,000 pounds of seed were used to re-vegetate the project site. Over 10 acres of land was planted, including adjacent riparian terraces and near-channel areas. This stream restoration project was implemented to help meet multiple local and regional objectives relating to stream channel instability, water quality, and habitat. Through this project, accelerated streambank erosion has been eliminated; aquatic habitat has been improved; riparian areas have been enhanced; and sediment loading to the WFWR has been reduced by over 98% improving the WFWR and Beaver Lake’s water quality.